What will your excuse be tomorrow before Allah? Praise be to Allah Who has created us to worship Him and has prescribed His religion and sharee’ah for us to adhere to, and Who accepts our excuses for our mistakes and for what we forget or are forced to do. “Hold fast to that which We have given you” [al-Baqarah 2:63]. Religion is a serious matter that distinguishes truth from falsehood, it is not a thing for amusement [cf. Al-Taariq 86:13]. Many people do not take the matters of their religion seriously, and they offer feeble excuses. This is one of the signs of the Munaafiqoon (hypocrites), who take their religion for mockery and fun [cf. Al-Maa’idah 5:57], and when they are rebuked or advice is offered to them, they come up with excuses which in fact are worse than the sin for which they are offering these excuses. Often we hear strange responses from people when we seek to offer advice or confront them about their evil actions and sins. For example: Why do you not give up this sin? - These are difficult times, and everyone is like this. - I have not been guided yet. The joke you told is a serious matter, and it is making a mockery of Islam. - My intention is sound, and I only meant to have some fun. How can you work in this haraam job? - I can’t find any other job. Do you want me to die of starvation? How could you shake hands with a woman who is a stranger to you (non-mahram)? - My heart is pure. Why do you not wake your child up to pray Fajr? - Poor kid, he didn’t get enough sleep and he has to go to school. Your daughter has passed the age of ten and she is still wearing short clothes; why don’t you tell her to wear hijaab? - She is still young. When she reaches the age of puberty we will tell her to wear hijaab. Wear the correct Islamic hijaab. - It doesn’t look good on me. What will people say about me? The cover restricts my breathing. Fear Allah and do not wear abaayahs (outer garments) that are colourful or have patterns. - This is what is available in the stores. How can you bring the means of forbidden entertainment (TVs etc.) into your home? - Our wives and children put too much pressure on us. Why don't you pray in the mosque? - The Imam’s voice is off-putting, and there are too many offensive smells. Why do you shave off your beard, my brother? - Because it doesn't look nice, I can't grow a full beard. Thus people come up with excuses one after another, for major and minor sins alike, in a failed attempt to avoid feeling guilty and avoid the advice of sincere people. In order to find out the rulings on this matter and to learn more about this dangerous phenomenon, we will refer to the Book of Allah and the Sunnah of His Messenger (peace and blessings of Allah be upon him), and the words of the scholars. Some of the incidents of false excuses referred to in the Qur'an: Allah has mentioned in His Book some examples of false excuses, many of which were made by the Munaafiqoon, such as their excuses for failing to perform obligatory duties, the chief of which was jihad for the sake of Allah, and other duties. Here Allah states that when the Muslims returned to Madeenah, the Munaafiqoon would offer excuses. “Say (O Muhammed) ‘Present no excuses, we shall not believe you” means, we will not accept it as true. “Allah has already informed us of the news concerning you” means, Allah has already told us about you. “Allah and His Messenger will observe your deeds” means, your actions will be made known to people in this world. “In the end you will be brought back to the All-Knower of the unseen and the seen, then He (Allah) will inform you of what you used to do” means, and He will inform you of your deeds, both good and bad, and will requite you accordingly. “When I heard that (the Prophet (peace and blessings of Allah be upon him) was on his way back from Tabook), I was filled with remorse and I began to think of a lie that I could tell so as to escape his anger and I consulted some of my relatives to ask for their advice. But when I heard that the Messenger of Allah (peace and blessings of Allah be upon him) was close at hand, thoughts of falsehood left me and I knew that I would never find a way out by lying, so I resolved to tell the truth. In the morning, the Prophet (peace and blessings of Allah be upon him) entered (Madeenah), and whenever he returned from travelling he would always go to the mosque first. So he prayed two rak’ahs there, then sat down to await the people. When he did that, those who had stayed behind came and began to make excuses, swearing oaths. There were eighty-odd of these men. The Messenger of Allah (peace and blessings of Allah be upon him) accepted their public declarations and oaths of allegiance, and prayed for forgiveness for them, referring their secret thoughts to Allah. Then I came to him and greeted him with salaam, and he smiled as a person who is angry smiles, then he said: ‘Come here.’ So I came and sat down before him. He said, ‘What kept you back? Did you not buy a mount (riding animal)? I said, ‘Yes. By Allah, if I were sitting with anyone else in this world, I would think that I would be able to escape his wrath by making some excuse, for I am skilled in argument. But by Allah, I know that if I told you a lie that you would accept, then soon Allah would provoke your anger against me. But if I tell you the truth, which will make you angry with me, I hope that Allah will forgive me for it. By Allah, I had no excuse. I have never been stronger or richer than when I stayed behind.’ The Messenger of Allah (peace and blessings of Allah be upon him) said: ‘As far as that is concerned, he has told the truth. Get up (and wait) until Allah decides concerning you.’ So I got up, and some men from Banu Salimah got up and followed me, saying, ‘By Allah, we have never known you to commit any sin before this. How come you were unable to offer an excuse to the Messenger of Allah (peace and blessings of Allah be upon him) as the others who stayed behind did? It would have been sufficient if the Messenger of Allah (peace and blessings of Allah be upon him) had asked for forgiveness for your sin.’ By Allah, they kept at me until I wanted to go back and give the lie to myself. Then I asked them, ‘Is there anyone else who is in the same position as I am?’ They said, ‘Yes, there are two men who said something like what you said, and the same answer was given to them. I said, ‘Who are they?’ They said: ‘Muraarah ibn al-Rabee’ al-‘Amri and Hilaal ibn Umayyah al-Waaqifi.’ They had told me the names of two righteous men who had been present at Badr and who were exemplary characters. I remained silent when they mentioned them to me.” (Narrated by al-Bukhaari, 4066). When Allah mentioned those who told lies to the Messenger of Allah (peace and blessings of Allah be upon him) and offered false excuses for staying behind, He mentioned them in the worse way that they could ever be mentioned: “They (the hypocrites) will present their excuses to you (Muslims), when you return to them. Say (O Muhammad) ‘Present no excuses, we shall not believe you. Allah has already informed us of the news concerning you. Allah and His Messenger will observe your deeds” [al-Tawbah 9:94 – interpretation of the meaning]. “And a band of them ask for permission of the Prophet.” It was narrated from Ibn ‘Abbaas (may Allah be pleased with him) that they said: “We are afraid that our houses may be robbed.” This was stated by more than one (of the scholars). They used the excuse of going back to their houses, claiming that they lay open (to attack), i.e., there was nothing to protect them from the enemy, so they were scared that the enemy may attack their houses. Allah said (interpretation of the meaning): “And they lay not open” – it was not as they claimed. “They but wished to flee” – i.e., to run away from battle. (Tafseer Ibn Katheer). “And among them is he who says: ‘Grant me leave (to be exempted from Jihaad) and put me not into trial.’…” i.e., because he feared the temptation of the women of Bani’lAsfar. But this is not the case. The trial into which he fell by staying behind from accompanying the Messenger of Allah (peace and blessings of Allah be upon him) and preferring his life to the life of the Messenger of Allah (peace and blessings of Allah be upon him) was a far greater trial… “And verily, Hell is surrounding the disbelievers” means, they will not be able to find any way out or means of escape from it. “O you who disbelieve (in the Oneness of Allah — Islamic Monotheism)! Make no excuses this Day! You are being requited only for what you used to do” [al-Tahreem 66:7 - interpretation of the meaning]. (5) Another of the foolish excuses of which Allah has told us in His Book, is that which the Children of Israel made to their Prophet Moosa (peace be upon him) when he was leading them towards the Holy Land (Palestine). Ibn al-Qayyim (may Allah have mercy on him) said concerning these Jews: One of the ways in which the Shaytaan played with them is when Allah had saved them from the tyranny and oppression of Pharaoh, and had parted the sea for them, and had shown them the signs and miracles, and had helped them and protected them and granted them glory, and given them what He had not given to any other among the ‘Aalameen (mankind and jinns, in the past) (cf. Al-Maa’idah 5:20), Then He commanded them to enter the town which Allah had decreed was to be theirs. This included the glad tidings for them that they would prevail and conquer the land, and that that town would be theirs, but they refused to obey his orders, and they responded to this command and these glad tidings by saying: “So go you and your Lord and fight you two, we are sitting right here” [al-Maa’idah 5:24 – interpretation of the meaning]. “O Moosa! In it (this holy land) are a people of great strength” [al-Maa’idah 5:22 – interpretation of the meaning]. They showed no respect to the Messenger of Allah, the one with whom Allah had spoken, and they even addressed him by his first name, instead of saying “O Prophet of Allah”. They said that there were strong people dominating that town, and they forgot the power of the One Who dominates the heavens and the earth, Who could subjugate those tyrants to the people who obeyed Him. Their fear of those tyrants, whose forelocks were in the Hand of Allah, was greater than their fear of the Compeller, the Most High, may He be exalted, and they had more fear in their hearts of them than of Him. (1) They stated the reason for their disobedience: “In it (this holy land) are a people of great strength”. (2) They stated that they would not obey; the sentence starts with the word “inna” which signifies affirmation (e.g., verily, indeed), followed by the word “lan”, a negation which implies “never”, i.e., we will not enter it now or in the future. Then they stipulated a condition for their entering the town, which was that the tyrants should leave. Then “Two men of those who feared (Allah and) on whom Allah had bestowed His Grace” [al-Maa’idah 5:23 – interpretation of the meaning] – by obeying His command, from among those who feared Allah – this is the view of the majority and this is correct. “[They] said: ‘Assault them through the gate’ [al-Maa’idah 5:23 – interpretation of the meaning], i.e., the gate of that town: attack them, for they are filled with fear of you. Glory be to the One Whose patience was so great that when they responded to His command in this manner and addressed His Messenger in this way, He was forbearing towards them and did not hasten to punish them. His patience and kindness was so great that the worst punishment He gave them was to make them wander in the desert for forty years, with the clouds shading them from the heat and with manna and quails sent down for them. Having read the aayat in which Allah mentions the false excuses and responds to them, we should go back and think about our duties and what is required and expected of us. 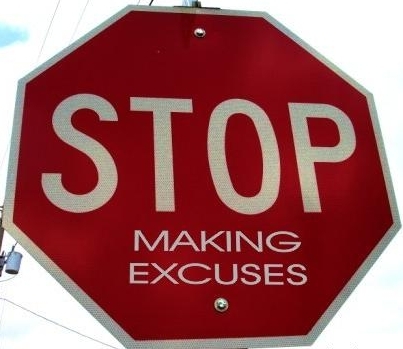 We should think of our own shortcomings and the excuses that we have in mind or that we give to others. Allah has sent down His Book to us Muslims and He has obliged us to obey Him and follow His commands. We have no excuse not to follow the sharee’ah, and we have no option when it comes to Allah’s commands. Let us remember what Sa’d ibn al-Rabee’ said to Zayd ibn Thaabit with his dying breath: “Tell my people the Ansaar that they have no excuse before Allah if some harm reaches the Messenger of Allah (peace and blessings of Allah be upon him) and their eyes are still blinking (i.e., they are still alive).” Then his soul slipped away; may Allah be pleased with him. “Therefore fear not men but fear Me” [al-Maa’idah 5:44] Is it not a form of Shirk for a person to fear other people as he fears Allah or even more so? No one has any excuse whatsoever for disobeying Allah and going against His commands when he knows of them and is able to do what he is commanded and avoid what is forbidden. If there (really) was an excuse, he would not deserve to be punished and blamed, either in this world or in the hereafter. Blame yourself, done not blame someone else * and die of regret, for you have no excuse. Some people use the Shaytaan as an excuse. So there are two kinds of excuses: those in which a person does not admit that he was wrong – which contradicts the idea of repentance, and those in which a person does admit that he was wrong – which makes repentance complete. Acceptable excuses On the other hand, there are some sincere people who Allah knows that they did not do some of the things that were enjoined upon them because of something that prevented them from doing so. These are some examples: It was reported from Anas (may Allah be pleased with him) that the Prophet (peace and blessings of Allah be upon him) was on a campaign and he said: “There are some people in Madeenah and we did not travel through any valley or mountain pass but they were with us, and they were prevented from coming with us for a genuine reason.” (Narrated by al-Bukhaari, 2627). Allah explained the situation of those who had excuses not to go out for jihaad and who came to the Messenger of Allah (peace and blessings of Allah be upon him) to make their excuses and explain to him that they were weak and unable to go out for jihaad. They came from Arab tribes who lived around Madeenah. Ad-Dahaak said that Ibn ‘Abbaas used to recite it “jaa’a al-ma’dharoon” – without a shaddah – meaning those who had excuses… This meaning is more apparent, because Allah then says: “and those who had lied to Allah and His Messenger sat at home” meaning, others from among the Bedouin stayed at home and did not come to offer excuses. Then Allah warned them of a painful torment and said: “a painful torment will seize those of them who disbelieve”. (Tafseer Ibn Katheer). “Except the weak ones among men, women and children” [al-Nisaa’ 4:98] He said: my mother and I were among those who were excused by Allah… (Narrated by al-Bukhaari, 4222). The Prophet (peace and blessings of Allah be upon him) used to accept the excuse of those who had valid excuses. It was reported that al-Mugheerah ibn Shu’bah said: I ate garlic then I came to where the Prophet (peace and blessings of Allah be upon him) used to pray, and I had already missed one rak’ah. When I entered the mosque, the Prophet (peace and blessings of Allah be upon him) noticed the smell of garlic. When the Messenger of Allah (peace and blessings of Allah be upon him) finished his prayer, he said, “Whoever has eaten from this plant, let him not come near us until the smell has gone away.” When I finished my prayer, I came to the Messenger of Allah (peace and blessings of Allah be upon him) and said: “O Messenger of Allah, give me your hand.” And I put his hand inside the sleeve of my shirt so that he could feel the wrapper around my chest. He said, “You have an excuse.” (Narrated by Abu Dawood, 3330. Classed as saheeh by al-Albaani, may Allah have mercy on him; Saheeh Abi Dawood, 2/726). “the wrapper around my chest” – their custom was that when a person was hungry, he would wrap something tightly around his stomach, and sometimes they would place a stone beneath the wrapper. (Awn al-Ma’bood, Kitaab al-At’imah; transmitted from al-Nihaayah by Ibn al-Atheer). Excuses have a great impact on the soundness of good deeds and the application of the rulings. Some texts were narrated concerning those who have excuses, and if these texts are not connected to people who have excuses they will be open to misinterpretation. An example of this is the hadeeth of Abu Hurayrah which states that the Prophet (peace and blessings of Allah be upon him) said; “Whoever catches up with one rak’ah of Subh (Fajr) prayer before the sun rises has caught up with Subh, and whoever catches up with one rak’ah of ‘Asr prayer before the sun sets has caught up with ‘Asr. (Narrated by al-Tirmidhi, who said: the hadeeth of Abu Hurayrah is a saheeh hasan hadeeth). This is the hadeeth on which our companions and al-Shaafa’i and Ahmad and Ishaaq based their opinion. They interpreted this hadeeth as referring to a person who has an excuse, such as a man who sleeps and misses the prayer, or forgets it and then wakes up and remembers it just before the sun rises or sets. (Narrated by al-Bukhaari, 545; al-Tirmidhi, 171 – this version was narrated by him). It was reported from Abu Hurayrah that the Prophet (peace and blessings of Allah be upon him) said: “I nearly decided to tell my servants to gather firewood, then I would have told them to give the iqaamah and start praying, then I would have burned the houses of people who did not attend the prayer.” (Narrated by al-Tirmidhi, 201; classed as saheeh by al-Albaani, may Allah have mercy on him; Saheeh al-Tirmidhi, 1/69). Abu ‘Eesaa said: the hadeeth of Abu Hurayrah is a saheeh hasan hadeeth. It was also narrated from other companions of the Prophet (peace and blessings of Allah be upon him) that they said: “Whoever hears the call [to prayer] and does not respond, his prayer does not count.” Some of the scholars said: this is a strict emphasis: there are no concessions for not praying in jamaa’ah, except for those who have valid excuses. Ibn al-Mundhir (may Allah have mercy on him) said: I do not know of any difference of opinion among the scholars concerning the fact that the sick person may not attend prayers in jamaa’ah because of his sickness. Ibn ‘Abbaas narrated that the Prophet (peace and blessings of Allah be upon him) said: “Whoever hears the call (to prayer) and has no excuse not to respond to it -” They said: “What excuse could he have, O Messenger of Allah?” He said: “Fear or sickness, otherwise the prayer that he performed will not be accepted.” (Narrated by Abu Dawood, 464; classed as saheeh by al-Albaani, may Allah have mercy on him , without the phrase “What excusecould he have?”, in Saheeh Abi Dawood, 1/110) Whatever the case, the sick person has a legitimate reason which means that he is excused from doing acts of worship or may make them up later. In al-Bukhaari it was reported that when the Prophet (peace and blessings of Allah be upon him) was terminally ill, Bilaal would come to him and call him to pray, and he would say, “Tell Abu Bakr to lead the people in prayer.” But not every sickness is an excuse for not praying in congregation. What is referred to here is debilitating sickness. Shaykh Muhammad al-Saalih al-‘Uthaymeen said in al-Mumti’ (4/438-439): the sickness which excuses a person from attending prayers in jamaa’ah and Friday prayers is the sickness which will cause him great hardship if the person goes to pray. Naafi’ said: Ibn ‘Umar gave the adhaan on a cold night in Dajnaan, then he said: Pray where you are. He told us that on a cold or rainy night during a journey, the Messenger of Allah (peace and blessings of Allah be upon him) would to tell the muezzin to give the adhaan, then immediately afterwards he would say: pray where you are. (Narrated by al-Bukhaari, 596). It was reported that Jaabir said: we went out with the Messenger of Allah (peace and blessings of Allah be upon him) on a journey, and it rained, so he said, “Let whoever among you wishes, pray where he is.” (Narrated by Ahmad, 13827; Muslim, 1127; Abu Dawood, 899). It was reported that Ibn ‘Abbaas (may Allah be pleased with him) said to his muezzin on a rainy day: After you have said ‘Ashhadu anna Muhammadan Rasool-Allah (I bear witness that Muhammad is the Messenger of Allah), do not say ‘Hayya ‘ala’l-salaah (come to prayer); say ‘Sallu fi buyootikum (pray in your houses). It was as if the people found that strange, so he said: Do you find it strange when someone who is better than I did that? – meaning the Prophet (peace and blessings of Allah be upon him) – Calling people to pray Jumu’ah is emphatically obliged, but I did not want to make you come out to walk in the slippery mud. (Agreed upon. Al-Bukhaari, 850; Muslim, 1128). According to a hadeeth narrated by Abu ‘Awaanah from Ibn ‘Umar: a cold or windy night. Fear is of three types: fear for oneself, fear for one’s wealth or property, and fear for one's family. 1. Fear for oneself: when a person fears that he may be seized by a tyrant, enemy, thief or wild animal, etc., which would cause him harm. 2. Fear for one’s wealth or property: when a person fears a tyrant or thief and the like, or he fears that his house may be robbed or burned down etc., or he has bread in the oven or something cooking on the stove and he fears that it may burn if he goes and does something else, or he has some good which he left with another person, and if he does not catch up with him, he may disappear with his good. These and similar cases are valid excuses for not attending Jumu’ah prayers or prayers in jamaa’ah. 3. Fear that one’s child or family may be lost, or a person’s child is lost but there is the hope of finding him at that time, or he has a sick family member who needs him or he has to stay close to the sick person. Ibn al-Mundhir said: It was reported that Ibn ‘Umar called upon Sa’eed ibn Zayd in the late morning, and he came to him in al-‘Aqeeq and missed the Jumu’ah prayer. This was the view of ‘Ataa, al-Hasan, al-Oozaa’i and al-Shaafa’i. The fourth excuse: when food is ready. If dinner is ready at the time of the prayer, it is mustahabb to eat first and then pray, because then one’s heart and mind will be more focused. Ibn ‘Umar ate even though he could hear the imaam reciting (in the prayer). Our companions said: eating dinner takes priority over the prayer in congregation if one is desperate to eat. Al-Shaafa’i also said something similar. But this excuse will not be accepted from someone who deliberately serves food at the time of the prayer in jamaa’ah, because this is a trick. The fifth excuse: urgent need to pass urine or stools. Ibn Qudaamah (al-Mughni 1/630) said: this means, if a person is suppressing (the urge to pass urine etc. ), it is makrooh for him to pray until he has answered the “call of nature”, whether he fears that he will miss the prayer in jamaa’ah or not. What this means is that if he stands up to pray and there is something that will distract him from having the proper attitude of humility and presence of mind, and he goes against that and prays anyway, his prayer will still be valid. This is the case in this situation (the need to pass urine or stools) and in the situation referred to above (when food is ready and one is very hungry). The sixth excuse: when one feels very drowsy Shaykh Muhammad ibn ‘Uthaymeen (al-Mumti’, 4/447) said: If a person feels very drowsy, he is excused if he does not attend Jumu’ah or a prayer in jamaa’ah. An example of that is a man who is very tired because of work or travelling, and he is overcome with drowsiness. He can do one of two things: either he can go and pray in jamaa’ah even though he is so sleepy and does not know what he is saying, or he can sleep so that the drowsiness will pass and then he can pray in a refreshed and relaxed manner. We say, do the latter, because you have a valid excuse. For some people, doing wudoo’ gets rid of the drowsiness and refreshes them; in this case a person should not miss the prayer in jamaa’ah. The hadeeth is talking about overwhelming drowsiness. The seventh excuse: strong cold winds on a dark night. 1. The wind should be so cold that it is difficult to go out in it. 2. It should be a strong wind, because a gentle breeze does not cause any difficulty. But we must note here that the ignorant person does not have a permanent excuse. Whoever is able to learn and does not do so, or is able to ask and seek fatwaas and deliberately does not do so, has no excuse. These excuses vary in strength and validity. Some of them are valid, such as #s 14, 20 and 22; some of them are feeble, such as #s 9, 27, 32. The problem is that many of those who do not attend do not appreciate how much they have missed and how much reward they have lost by not being there. If they understood what they have missed, they would do their utmost to resolve their situation and strive to remove the obstacles that are preventing them from attending. Problems must be dealt with according to each individual case. They must be confronted, advised and dealt with according to the level of their excuses. Some people’s excuses may be accepted straight away, whilst still pointing out to them how much they are missing. Others may need to be questioned further in order to make them realize that their excuses are flimsy. Sometimes keeping quiet when a person makes an excuse may be the best response. It may also be useful to combine clear statements with hints. 1- Explaining the importance of time and how to make the most of it. “And He it is Who has put the night and the day in succession, for such who desires to remember or desires to show his gratitude” [al-Furqaan 25:62 – interpretation of the meaning]. 2- Always having a plan to help achieve a balance between the various interests of sharee’ah as far as possible, because sharee’ah is based on achieving interests and achieving a balance between them as far as possible. 3- Paying attention to priorities. Things which are fard ‘ayn [obligatory for each individual] come before those which are fard kafaayah [obligatory upon the community, and if some people fulfil them the others are not held accountable]; things which are fard kafaayah come before those which are generally recommended (mustahabb). We should know which things are more important than others so that we can give priority to those which are greater in virtue and reward when there is too much to be done. 4- Convincing parents that Islamic activities do not conflict with studies, by striving to achieve a high level in one's studies. 5- Helping students to overcome their shortcomings in their studies so that they will be able to attend activities. 6- Trying to bring forward or delay some family commitments so that one can attend Islamic activities. 7- Appropriate direct intervention on the part of the teacher or daa’iyah with the parent or guardian of the student, and intervening by seeking permission for the child to attend. 8- Coordinating timetables and seeking to reconcile family commitments with Islamic activities, such as taking a student to the activity after a family commitment or bringing him back from the activity before the commitment starts, so that although he may miss part of it he does not miss all of it. 9- Convincing the student that time is too precious to be wasted in gatherings in which there is no benefit, and that he should teach the people around him about how important time is to him so that they will not distract him with things that are of no benefit to him. 10-Explaining that attending these activities is a form of relaxation and a means of dispelling boredom, in addition to the benefits of increased faith and knowledge that they bring. 11-Preparing programs well and filling them with useful lectures and lessons and moving talks so that the people who attend will feel that they are really benefitting. 12-Using means of motivation in the program such as telling stories, giving examples and paying attention to exciting things that are permissible. 13-Striving to organize a schedule that will leave no room for excuses, such as reducing the number of days that the activity takes up, e.g. making it three or four times a week instead of every day. 14-Not going to extremes by making things obligatory that are not obligatory in sharee’ah, and accepting valid excuses. 15-Striving to resolve sensitive issues among friends and promoting an atmosphere of love. Teaching the participants about the brotherhood of faith by exhorting them and by setting the example. 16-Turning to Allah and asking Him to make things easy and to help us. O Allah, we seek refuge in You lest on the Day of Resurrection we may be among those who will not be permitted to put forth any excuse (cf. Al-Mursalaat 77:36). We ask You to make us adhere firmly to Your commands and to follow Your guidance resolutely. May we make the most of all good activities and be safe from sin. Grant us the victory of Paradise and save us from the Fire. May Allah bless our Prophet Muhammad and his family and companions, and grant them peace.